Turkey is located between two continents, giving it a unique blend of Eastern and Western cultures. 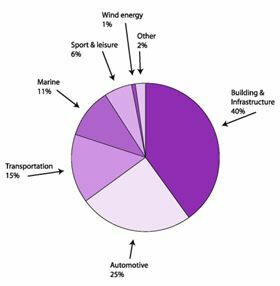 Construction is the largest market for the Turkish composites industry. Subor supplied this 78 km pipeline to carry potable water to Turkey’s capital city Ankara from the Kizilirmak river in the north of the country. Boytek was the main resin supplier for this project. 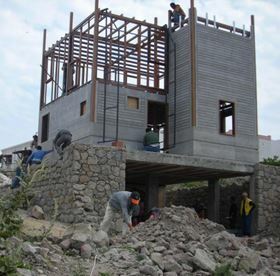 A two-storey summer house made with composite profiles. The house is on Aegean coast of Turkey, close to the sea, and so Boytek's chemical-resistant unsaturated polyester resin BRE 305 was used to produce the profiles. Turkish company Sirena Marine started the production of a 55 ft model in 2008. 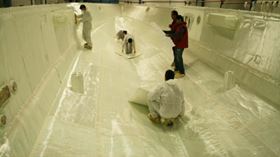 This boat is made using the vacuum infusion process employing custom-made multiaxial reinforcements from METYX Composites. RMK Marine is manufacturing 100 ft (30 m) and 125 ft (38 m) superyachts for Oyster Marine Ltd. RMK has built a new composites facility at its shipyard in Tuzla, featuring a 72 m hall and a 40 m long oven. The Oyster vessels will be produced using the vacuum infusion process and the first is scheduled for launch early in 2010. The picture shows the hull plug for the 125 model. Labranda produces the SeaCab ‘water taxi’, SeaCoach and SeaLiner ferries and other vessels. All vessels are reinforced with multiaxial fabrics (from METYX Composites) and PVC foam to assure lowest weight possible, which in turn helps operators to lower their operating costs. The company’s shipyard is in Tuzla. Labranda also has two joint ventures in Abu Dhabi with Al Jaber Group. One will build luxury megayachts for the Middle East region, and the second will manufacture work boats and passenger ferries. 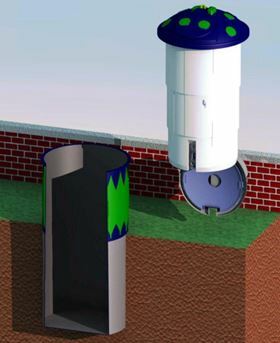 This underground waste container is manufactured by BGMS Composites in an RTM process using fire retardant resins and high flow METCORE reinforcements from METYX Composites. The containers have higher capacity and occupy less space than standard containers, which is an attractive feature for densely-populated municipalities. BGMS also manufactures the composite structures for some of Labranda’s marine vessels. The Ford factory in Eskisehir, Turkey, has been producing RTM parts for the Ford Cargo truck since 2003. 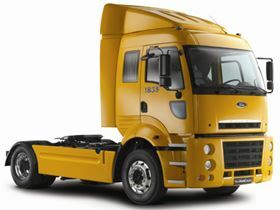 This vehicle is unique in the commercial truck market in Europe since it has the highest number of RTM parts/truck. The 1835 model features 16 RTM parts and one SMC part. The manufacturing of most of the parts is outsourced but five are still made by Ford. Turkey is among the world's top 20 largest economies (predicted to be amongst the top 10 by 2050) and one of the top 10 emerging markets. 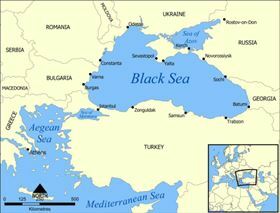 Located between Europe and Asia, it provides a route for the Black Sea basin countries (including Russia and the Ukraine) to reach the Mediterranean Sea. The country also has easy access to the markets of Central Asia and the Middle East. Turkey is a rapidly developing country, seeking to modernise its economy, and it is in negotiations to join the European Union (EU). Increased political and economic stability have led to growth in the Turkish economy over recent years and this has resulted in increased foreign investment. With the onset of the global economic crisis the Turkish economy has now slowed down in line with other emerging markets. Over 70% of Turkey’s 70 million population live in urban areas. The agricultural sector still accounts for over 30% of employment, but industry accounts for nearly 30% of gross domestic product (GDP). The largest industrial sector is textiles and clothing, but this is facing strong competition from international markets. Tourism has experienced rapid growth in the last 20 years and is now an important part of the economy. Turkey also has a large and growing automotive industry and it is a leading shipbuilding nation. Construction is another key sector for the Turkish economy. Turkey is investing significant sums in upgrading its infrastructure, including projects to build new dams, airports, roads and water and sewerage systems. Its recent economic growth, a talented, young workforce and its geographical location make Turkey an attractive destination for investment. The Turkish composites industry is small and until the recent economic crisis it has been growing. Construction is one of Turkey’s biggest industries and the largest market for the composites industry. The industry has also expanded to provide services outside of Turkey and many construction companies have branched out into other parts of the world from their base in Turkey. Turkey is home to two large composite pipe manufacturers, Subor and Superlit. Subor was established in 1996 to manufacture glass reinforced plastic (GRP) pipes for domestic and international markets. It uses the Flowtite filament winding technology from the Saudi Arabia-based Amiantit Group and has two production plants in Turkey. The company says it has supplied GRP pipes to more than 900 projects in Turkey and abroad, in industries including drinking water, irrigation, waste water, industrial plant, and energy. Superlit Boru Sanayi AS was founded in 1961 and produces glass reinforced polyester pipes by the filament winding and centrifugal casting processes. It also has strong international sales activities. The automotive industry is another important market for the Turkish composites industry. Its strategic market location, relatively low cost, and abundance of skilled labour, have made Turkey a good base for international car makers. This, combined with a growing domestic market, has prompted nearly 20 international vehicle producers to set up production in the country. Turkey is one of Europe's largest bus and coach manufacturers and there are over 700 companies in the country manufacturing a wide variety of automotive components. Temsa, a subsidiary of leading Turkish financial and industrial group Sabanci, is one of the leading independent bus and coach manufacturers in Europe and it opened production facilities in Egypt in 2008. Unsurprisingly, given its location, Turkey has a long history of shipbuilding. Turkish boat builders are mostly located around the three big cities of Istanbul, Izmir and Antalya. Most of Turkey’s boat builders are now exporting to European and Middle East countries. Hand lay-up is the dominant process but vacuum infusion is becoming more popular. 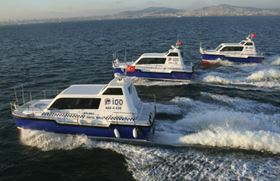 Turkish company Sirena Marine started the production of a 55 ft model in 2008, using the vacuum infusion technique. International boat builders are also starting to set up manufacturing operations in Turkey. RMK has built a new composites facility at its shipyard in Tuzla, Istanbul, to manufacture 100 ft (30 m) and 125 ft (38 m) luxury superyachts for UK company Oyster Marine Ltd. The Oyster vessels will also be produced using the vacuum infusion process. Energy demand in Turkey is growing and Turkey’s wind energy market has strong potential. According to the Global Wind Energy Council (GWEC)’s report Global Wind Energy Outlook 2008, a record 97 MW of new wind energy capacity was installed in Turkey in 2007, taking the total to 246 MW. German company Enercon was the first foreign wind turbine producer to start manufacturing in Turkey. It set up a production facility for rotor blades in 2002. Nordex , another German turbine producer, established a subsidiary in Istanbul in April 2009. Vestas has a sales office in Istanbul. Model Enerji is aiming to be the first Turkish company to manufacture megawatt (MW)-size turbines. In August 2008, it announced a licensing agreement with American Superconductor Corporation Windtec (AMSC-Windtec) for its WT1650 (1.65 MW) turbine design. Under the terms of the deal, Model Enerji has exclusive rights to manufacture, sell, install, operate and maintain the WT1650 in Turkey and has non-exclusive rights for surrounding Mediterranean and Eastern European countries. Model Enerji, based in Istanbul, plans to have its first prototype commissioned in mid-2009 and to begin producing the turbines by the end of 2009. Turkish resin producer Boytek estimates that total unsaturated polyester resin demand in the country is 80 000-85 000 tonnes per year and that this is growing at around 7-10% each year. Boytek is the largest of the top three polyester resin producers in the country (alongside Cam Elyaf Sanayii AS and Poliya Polyester). The 30-year-old company, headquartered in Istanbul, produces unsaturated polyester and vinyl ester resins, gel-coats, pigment pastes and peroxides. It also distributes Owens Corning Vetrotex (OCV)’s glass fibre reinforcements and Ashland’s Derakane vinyl ester resins in Turkey. It has two factories and a new facility started production in August 2009, increasing the company’s total annual production to 78 000 tonnes/year. This makes it one of the five producers of unsaturated polyester resin in Europe, and one of the top 10 globally, says Boytek's Sales Manager Burak Darcan. Boytek’s biggest composites market (30% of production) is pipe – which is mainly used for water and sewage applications. One of its biggest customers is Turkish pipe producer Subor. Automotive is another important market for the company; international car makers including Ford, Toyota and Mercedes have all set up production plants in Turkey. “Aside from the pipe producers, which use filament winding or centrifugal casting methods, the main processes used are RTM [resin transfer moulding] for the automotive industry, spray-up and pultrusion for construction, infusion in marine, and hand lay-up is also applicable as in every composite market,” he says. Boytek claims a 38% share of the total unsaturated polyester resin market in Turkey and its strategy is to attain a 35-45% share of the Turkish composites market. The company exports about 25% of its production, mainly to Europe, Asia, the Middle East and Africa. It is also seeing growth in the Commonwealth of Independent States (CIS) countries, a number of which share the Turkic language. North Africa, where a lot of Turkish construction companies are working, is also an important market for Boytek, as is in Middle East and Asia. Cam Elyaf is the only producer of glass fibre manufacturer in Turkey. The company, a subsidiary of the large SISECAM group, has two furnaces and a capacity of 70 000 tons of glass fibre a year. Cam Elyaf also serves European customers from its logistics centres in Belgium and Germany. There are no epoxy resin producers in Turkey and use of epoxy resin is very limited, but the country will soon have a manufacturer of carbon fibre. Acrylic fibre producer AKSA, part of the large Akkok Group of companies, plans to start production of carbon fibre this year. Carbon fibre can be made from polyacrylonitrile (PAN) precursor, which is also used in the manufacturing process for acrylic fibres. AKSA was founded in 1968 and had a capacity of 308 000 tons/year of acrylic fibre in 2008 and around an 11% share of the global market. 2007 revenue was US$665 million and it employs around 600 people. Its production plant is in Yalova. The company is currently looking to develop complementary products, which led to the launch of its carbon fibre project in 2006, with a budget of US$85 000 000. The project team was made up of 30 people and R&D expenses were partially supported by Tubitak-Teydeb (The Scientific and Technological Reasearch Council of Turkey) under the scope of New Material Technologies. The project involved the development of a polymerisation unit, precursor unit and pilot scale continuous carbonisation line (34 ton/year capacity) for trials. A full-scale carbon fibre plant with capacity of 1500 tons/year is under construction and start-up is planned to finish in the second half of 2009. Initial products will be 6K, 12K, 24K and 26K. The fibre sizing will be selected according to the end-use application. AKSA is mostly using epoxy compatible sizing at present. The products will be sold under the trade name AKSACA. Tamer Bozaci, AKSA’s Carbon Fibre Project Manager, told Reinforced Plastics that the initial target markets for the company’s carbon fibre will be industrial applications, such as high pressure storage vessels (for liquified natural gas [LNG], for example), wind turbine blades, and transportation (marine craft, trains, and cars). In the longer term the company hopes to enter the aviation market, but qualification for this sector takes time. There are some users of carbon fibre in Turkey, for example Yonca-Onuk builds fast boats in advanced composites for the Turkish Coast Guard and for export, and Turkish Aerospace Industries Inc (TAI) recently opened an Advanced Composites Manufacturing Facility (ACMF) in Ankara, to support its role as a major subcontractor to Northrop Grumman on the F-35 Lightning II Joint Strike Fighter programme, but most of AKSA’s production will be for export. The company also hopes that a local supply of carbon fibre will help the develop Turkish advanced composites market. As with all developing markets, a major challenge is educating Turkish manufacturers about the benefits of composites. The Kompoist Composite Products and Raw Materials Trade Fair, organised by the Turkish reinforced plastics association CTP-Sander aims to introduce composite products to end-users and increase the usage of GRP products in Turkey. The association estimates that the per capita useage of GRP in Turkey is currently only around 1.5 kg. The next Kompoist event will take place in June 2010 in Istanbul. Recognising the need for stronger, lighter structures and more competitive end-products in various industries, METYX Composites was founded in 2003 to provide the composites market with high performance reinforcement materials and the custom solutions necessary to achieve a leading edge in today’s market. The company serves customers globally across diverse industries including marine, automotive, wind energy, construction, pipe, and sporting goods. In Turkey, the company is heavily involved in the automotive and marine industries and it is now entering the rapidly developing wind energy sector. One of the company’s main products markis the METYCORE™ line developed mainly for RTM applications. This product is approved and being used by many companies, including Mercedes, MAN, Temsa, Ford, DAF, Azimut, Numarine and Oyster Marine. METYX also acts as distributor for several international composites suppliers and organises a biennial 'Composites Summit' designed to demonstrate the latest composites materials and processing technology. Kordsa says that its composite manufacturing facility has received international certification for the aerospace and defense industry. Sicomin has appointed two new distributors in the UAE and Turkey.